In a word: Wheely, wheely good!…Ok, not strictly one word and it came from my husband, I just couldn’t resist! Worth a visit? 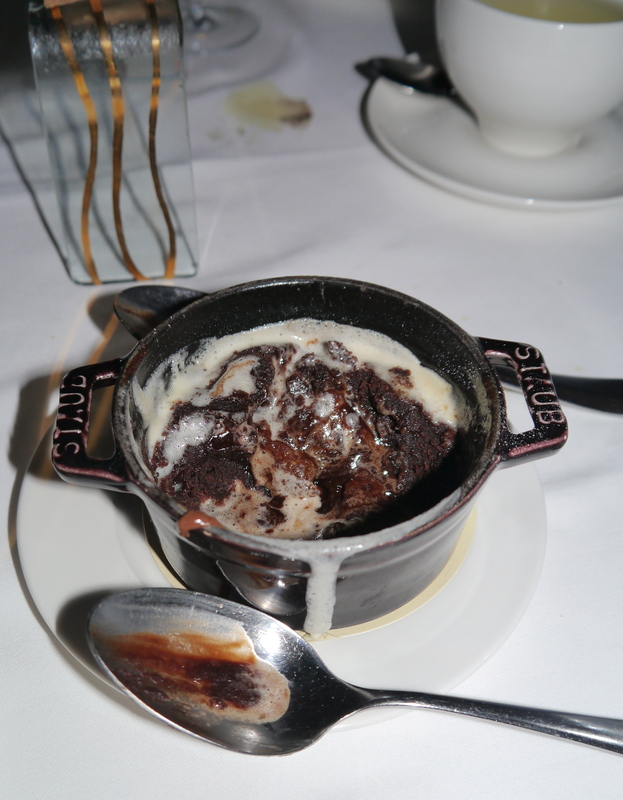 : Yep, I’m definitely going back, if only to finish off one of their Chocolate Fondants that defeated me! Brunch anyone? 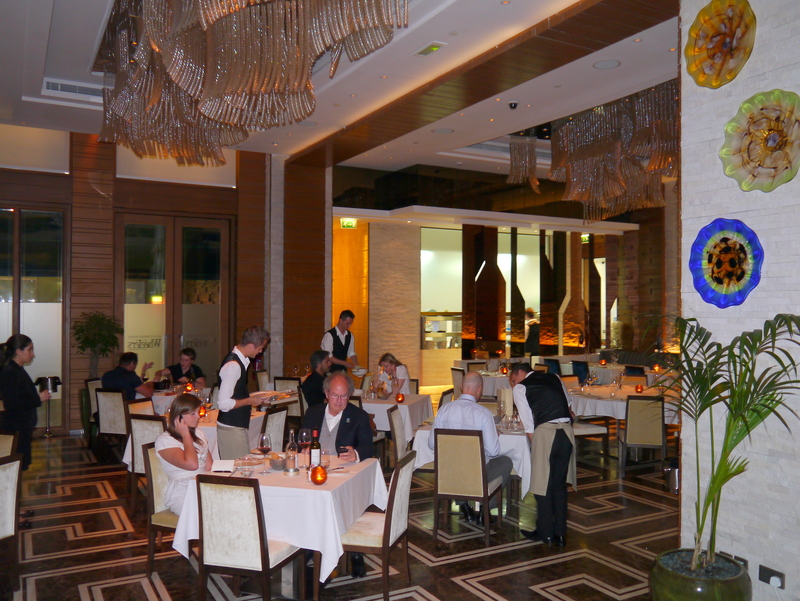 I was very kindly invited to dine at Marco Pierre White’s lastest Dubai offering by Sept PR to review the predominantly seafood-fare restaurants in DIFC, Wheeler’s of St.James’s. The original London branch of Marco Pierre White’s Wheeler’s of St.James’s is [almost] steeped in history, not it’s own, but that of the original Wheeler’s restaurant which dates back to the dark ages, well as far back as 1856 (check out the old menus here), and of Madam Prunier’s famous fish restaurant from the early part of the last century, the site of which Wheeler’s of St.James’s now occupies. 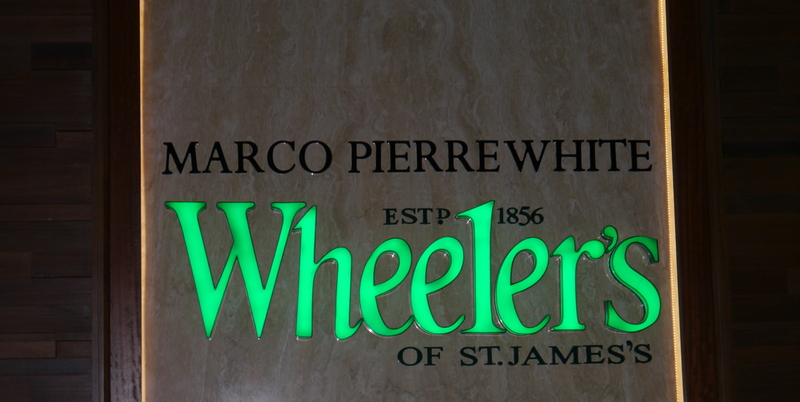 In the early part of this century, the floundering (excuse the pun) Wheeler’s chain was bought by Marco Pierre White, or MPW as we shall call him, and Sir Rocco Forte and resurrected as Wheeler’s of St.James’s Est 1856, and then in 2012, brought to Dubai by the RMAL Hospitality Group. 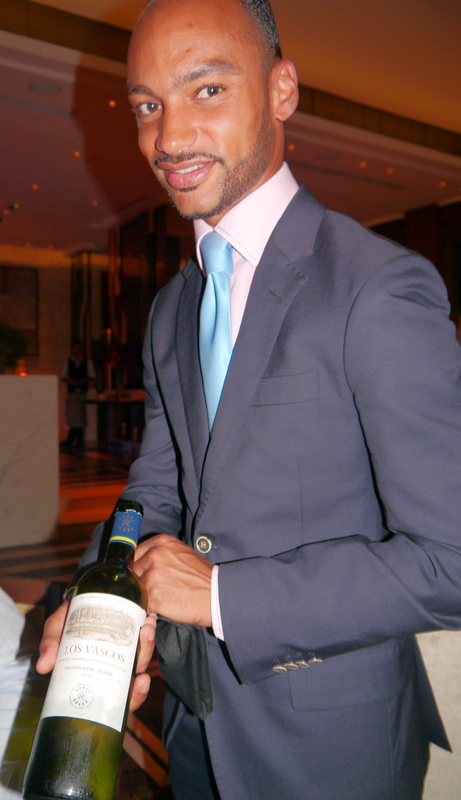 After a soft opening in the Autumn of 2012, Wheeler’s of St.James’s Dubai officially opened it’s doors in the financial distract, with liquor licence in hand, at the start of 2013. It appears to have had a slow start, which to be honestly I find hardly surprising with neighbours like Le Petite Maison and Roberto’s, however, if our experience is anything to go by, it will steadily build itself a reputation as a reliably great place to dine. 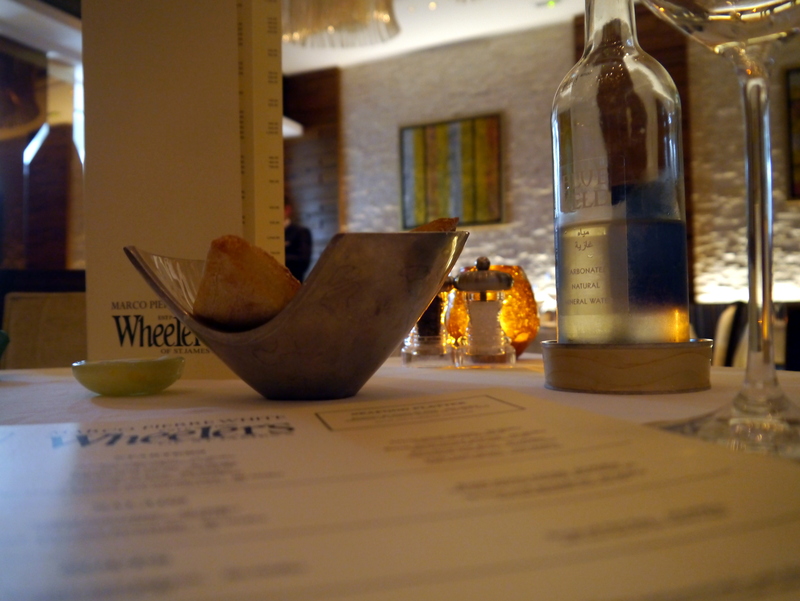 Wheeler’s philosophy appears to be a more relaxed approach to fine dining, they do serve fish and chips here after all. 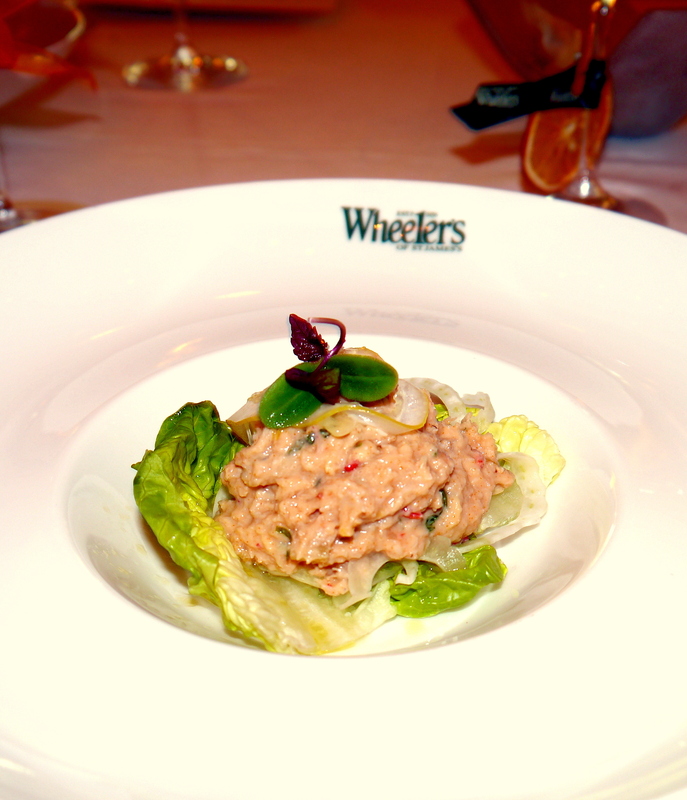 I see Wheeler’s as somewhere you come when you want the best fish in town simply dressed and served up generously in an elegant setting without all the fuss. By the best fish in town, I’m talking sea-fare sustainably sourced in the UK, and then rather unsustainably flown over to the desert and on your plate within 36 hours. Well that’s the ideal at least, as explained to me by Ross, the Assistant Manager, and I must say, my heart sunk a little as I thought of all those Airmiles being clocked up by fishes flying around the planet. I see that RAML and MPW are staying true to the reputation of the brand – British sea-fare restaurant serving up the best of British sea-fare. I noticed a couple of local sustainably sourced fish dishes on the menu, however, I’m not convinced that’s enough in such an eco-conscious era where even in Dubai local and sustainable are beginning to become buzz words…food for thought. 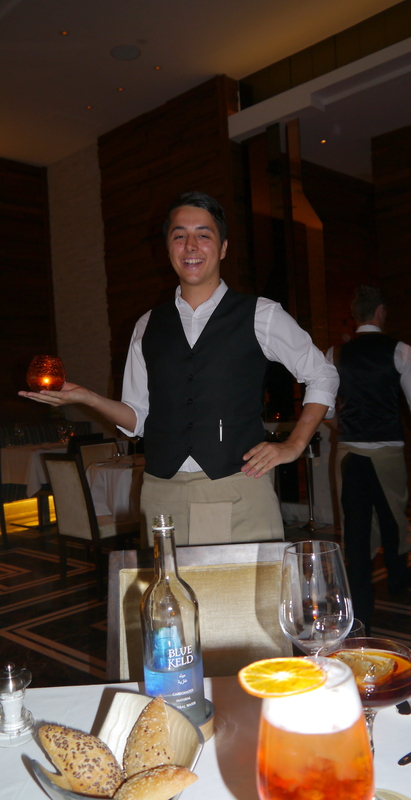 Azedine, the Head Sommelier, spent the evening pairing our food choices with the best from their wine list and explaining his choices as we went from one course to the next. I’m no wine buff, but I must say he got it spot on every time choosing wines that really complimented everything that touched our lips. We were treated to cocktails as an aperitif from the not-even-out-yet cocktail list, these were accompanied by the standard bowl of bread rolls, nothing too exciting; rustic looking, but not lovingly baked by hand, and then a little taster of the Seafood Bisque which had a rich, deep flavor and gave us a taster of what was to lie ahead! For my starter, I chose the Salt Cod Brandade with egg and asparagus on recommendation from the Senior Sous Chef, the lovely Beth Cosgrove. This dish is brilliant, the brandade is just the right balance of rich saltiness, the egg is perfect fried in a shell of batter and served with lightly steamed asparagus. The brandade was accompanied by a chilled glass of 2011 Pinot Grigio, Fantinel, Borgo de Tesis, from Italy, which went down a treat. My other half chose the Crab and Ginger Salad with lemon confit, served on a bed of baby gem lettuce and fennel. Again, another tasty dish, but to be honest with the brandade in front of me, it didn’t leave a memorable impression, although my other half enjoyed it. The salad came with a 2012 Chilean Sauvignon ‘Los Vascos’, Domaines Baron Rothschild. 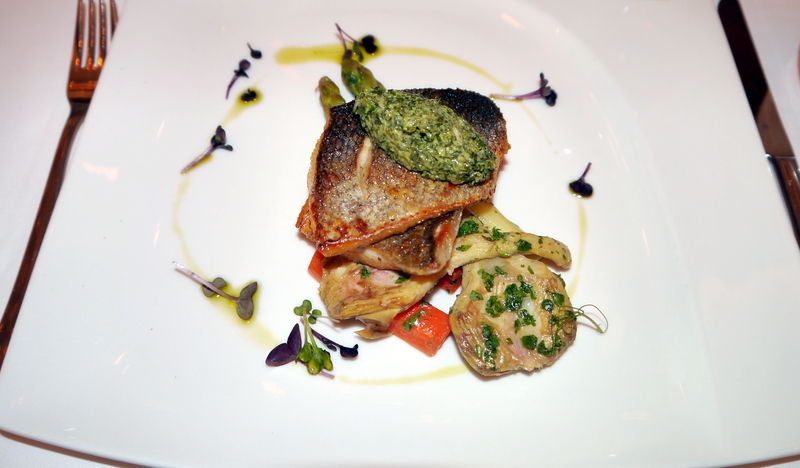 I had the Fillet of Sea Bass with violet artichoke and salsa verde for my main. This came panfried with a beautiful crispy skin, succulent flesh and a zesty blob of vibrant green salsa on top. Again, another triumph from the kitchen – fish served exactly how I like to make it myself, but way better! Definitely one to get the taste buds going. On Azedine’s suggestion, I controversially opted for a red with my fish supper; 2009 Pinot Noir Kumeu River from New Zealand. My other half went the whole hog and had the Dover Sole Meunière with sides of spinach and mushrooms. The huge fillet of sole literally took over the plate; it has quite a delicate flavor that was enhanced by the light clear herbed sauce. This delicate flavor worked well when paired with sides of beautifully rich and meaty mushrooms and buttery green spinach together with a glass of a 2010 Chablis la Pierrelée, from Domaine de la Chablisienne, France. And now for dessert, as has happened before, we had trouble deciding from the dessert menu. Luckily Super-Assistant Manager, Ross, came to the rescue and offered us a tasting plate of our top three. It turns out our interpretation of a tasting plate was a little different from Ross and Beth’s…I was delighted and at the same time saddened when three full sized desserts turned up on our table. I say saddened, as there was no way we were going to be able to polish off all three of them already stuffed from our starters and mains, although we would try our best in the name of food blogging! 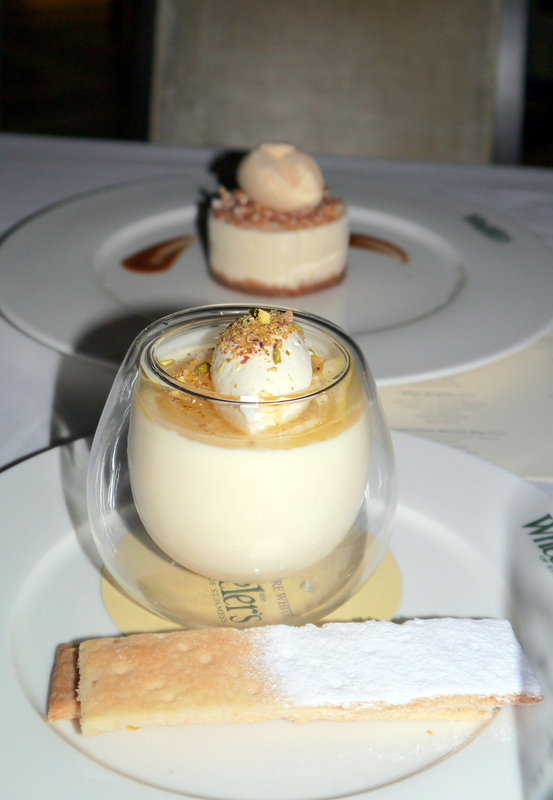 Our dessert adventures started with the Lemon Posset with stem ginger shortbread ice cream. 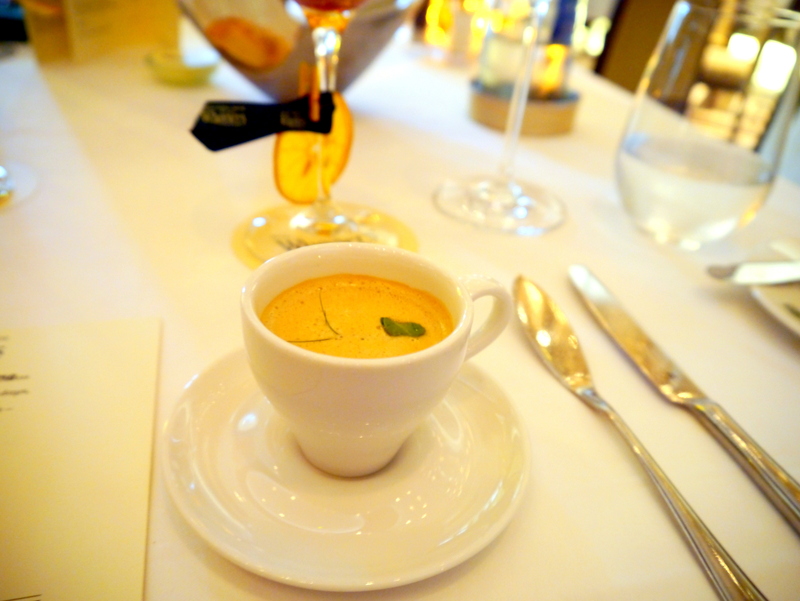 This zesty little number really cut through the flavours of the earlier dishes and cleansed the palate. The light creamy texture and bright lemon flavour topped off with homemade ginger ice cream really grabs your attention. I wasn’t sure the posset was going to work for my esperidoeidiphobia (citrus phobic, hilarious that there is a scientific name for it) husband, but we were both loved it. A fabulous start to our dessert feast. Next we sunk our spoons into the White Chocolate and Peanut Cheese Cake served with popcorn ice cream. 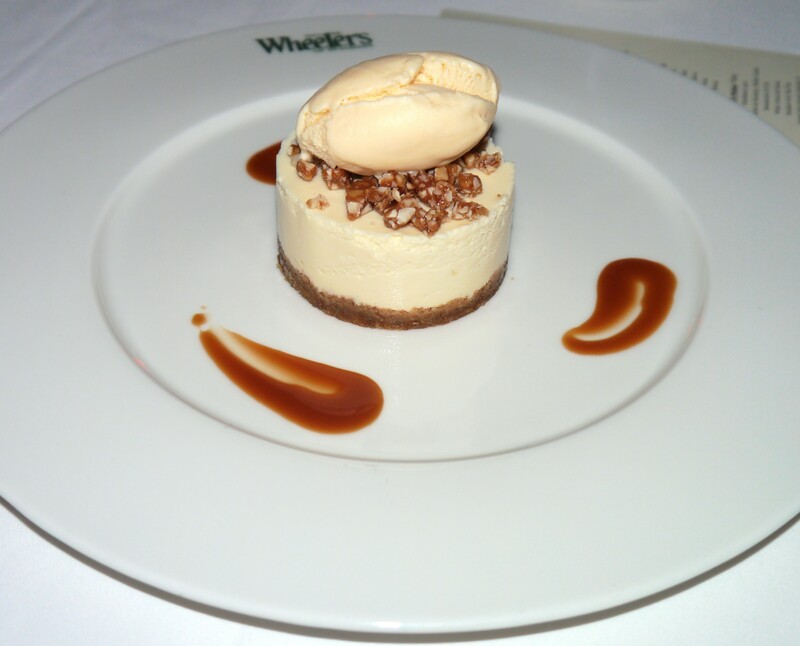 Oh my, this was good, I mean really good – thick and heavy with white chocolate, but still light and cheesecake-esq. 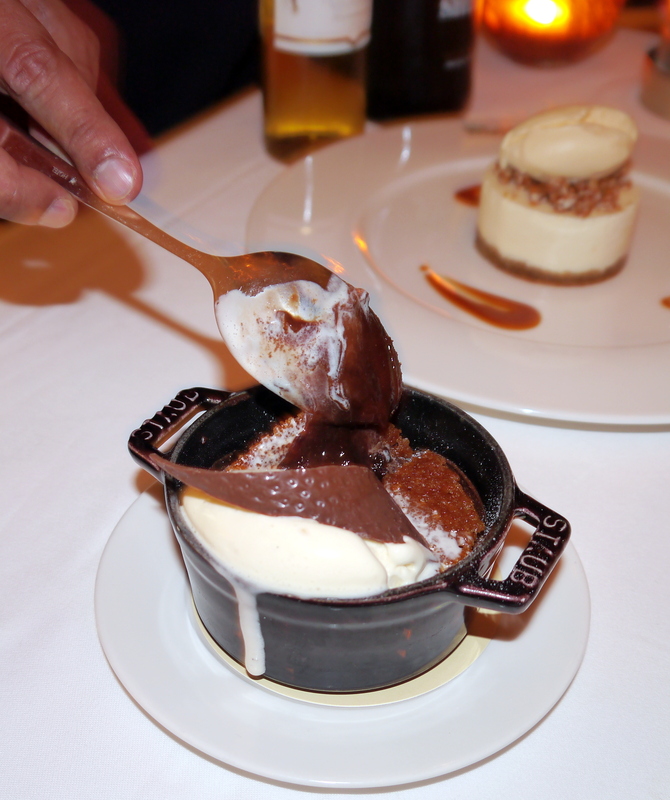 The popcorn ice cream (what an awesome idea) helped to make the dish extraordinary. We both loved it. We accompanied these first two desserts with another glass of Chilean white, this time the sweet 2011 Gewurztraminer Late Harvest, from the Montes Vinyard in the Curico Valley. Last, but by no means least from the dessert platter, was the Chocolate fondant with vanilla ice cream, which came highly recommended by Ross, and man was it good; a melted rich gooey chocolate mess enclosed in a shell of slightly firmer chocolate goodness that you must, according to Azedine, break into straight away to slow down the cooking process. With hindsight, we should have eaten this first as by the time we got to it the dish it had lost the liquid-goo melting centre and the texture had firmed up as it cooled down. In the end, we couldn’t finish it. In fact we barely started it. I’m ashamed to say the chocolate fondant defeated us! To round off out truly scrumptious meal, and with just enough room left, we finished with a glass of a very richly yet mellow Emilio Lustau Old East India Sherry. We were well and truly done, you could have rolled us out the door at this stage…It’s was one of those moments when I wish elasticated waistbands were socially acceptable for the under 60’s. On first look Wheeler’s of St.James’s comes across as a very English establishment; elegant yet understated and then your eyes wander and you notice the little accents of Arabic opulence, we are after all in the Middle East where no restaurant would be complete without random glass plates on the walls or fancy glass chandeliers. Having said that, don’t worry it’s not Burj Al Arab over the top! The place was pretty quiet for a Wednesday night, although the bar was busy. For me, this actually makes it a very nice atmosphere to dine in; one where you feel you can linger over your meal without being ousted from your seat by hungry dinners and you can enjoy a conversation you can actually hear without needing to shout. 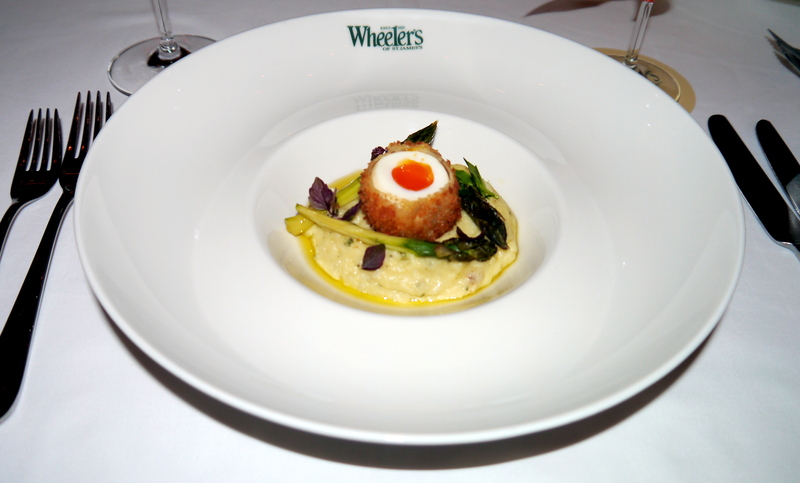 The presentation of food at Wheeler’s is simply stylish, as I mentioned before, there is minimal fuss: the food presented is fresh and full of vibrancy and has no real need for drizzles and foam to froufrou it up and detract from what is naturally good looking. From arrival to departure, I felt so welcomed and attended to by all the staff at Wheeler’s of St.James’s. I was particularly impressed with Ross, the Assistant Manager and our host for the evening, with Azedine, the Head Sommalier; his knowledge and passionate attitude inspired me to drink more, oh and Liam, one of the more entertaining wait staff, who like the fish was fresh from the UK! Mixologist, Massimiliano, also left an impression with his knowledge on the more potent liquors and served up a couple of cracking cocktails – totally different, deeply flavourful and rather dangerous! It’s really refreshing to find passionate staff who interact with you in an open and friendly manner; there was none of the aloofness or base-level of customer care you receive in some eateries, high-end or low-end, where staff won’t engage you in a conversation or can’t tell you what’s on the menu. I’d be interested to hear other’s opinions of the service here and we’ll be going back to sample their brunch menu as paying guests…and to finish off that Chocolate Fondant. 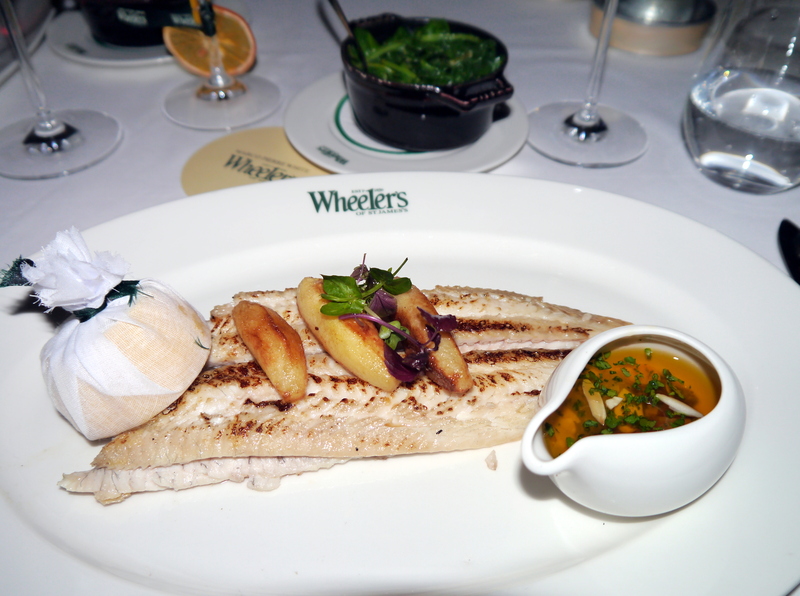 Wheeler’s of St. James’s is one of my classic ‘get what you pay for’ establishments: you’re paying for your fish to be flown business class fresh from the English Channel, swish surroundings, really generously portioned delicious food and great service you can share a joke with – such a rare thing in Dubai. The prices of mains vary from AED 75 for a vegetarian option to AED 325 for the lobster, with your fish sitting in the middle between AED 100 and AED 295. This meal was courtesy of Wheeler’s and Sept PR, who kindly invited me to dine and review their restaurant. Free valet parking at Gate Village Building 8 parking entrance, and i’d recommend you contact Smart Drive Dubai to get you and your car home safely after one of Azedine’s finest or Massimiliano’s dangerously good cocktails. Great review Helen! 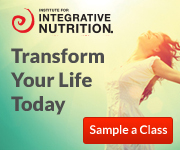 I’ve always wanted to check it out and your review has now pushed me to book that table! I’ll have the chocolate fondant all on my mine (thank you very much) – glad to hear the seafood is tops…excited to try it out!